For certain rheumatoid arthritis (RA) patients, having a service dog can provide multiple benefits. Bharat Kumar, MD, MME, RhMSUS, FACP, assistant professor of internal medicine, Division of Immunology, Allergy and Rheumatology at the University of Iowa Hospitals and Clinics, Iowa City, Iowa, has recommended the use of service dogs to patients with fairly severe RA, including those who have difficulty walking, bending or using their shoulders. For people with fatigue, a dog can provide a gentle pull that reduces the amount of energy exerted, Ms. Sneath-Zeiders adds. Service dogs are also trained to pick up items off the ground, reducing the owner’s need to bend over. Additionally, they can carry items, help patients get dressed or undressed, open and close doors, take out the trash, call for help and retrieve specific items or people from another room. 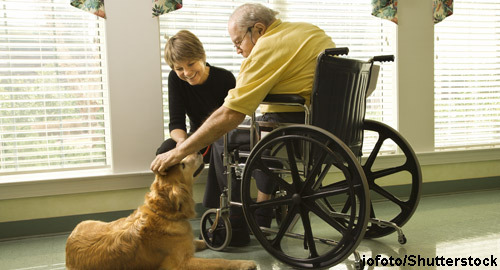 Because RA is associated with loneliness and depression, a service dog can also offer patients companionship. And Dr. Kumar has noticed an improvement in mood for RA patients who have service dogs. When significant evidence of disability and compromise exists for a patient, Dr. Kumar begins considering recommendations for a service dog. He consults with primary care providers, psychiatrists and other members of the patient’s healthcare team to identify patients with emotional challenges. In some cases, the data for using a service dog may be much stronger from a comorbid condition, such as depression, than for RA. Hi my name is Jennifer and I have RA ..I was wondering who do I talk to about getting a service dog ..I have nodgels all over the bottoms of my feet and all my joints are painful at times ..this disease is a very lonely disease and quite depressing ..I know if I had one of these dogs it would help me tremendously..
Had RA for almost 11 years. Even though I developed asthma 4 years ago, no problems with owning a black lab. Looking for a new dog but now also have fibromyalgia. Any suggestions on breed? Currently looking at beagles, Yorkies, & Boston terriers. For a service dog you might want to stick to a lab or Golden Retreiver. If it is just a normal dog I love my chihuahua. She is extremely loyal and with the right socialization chihuahuas can be very loving.